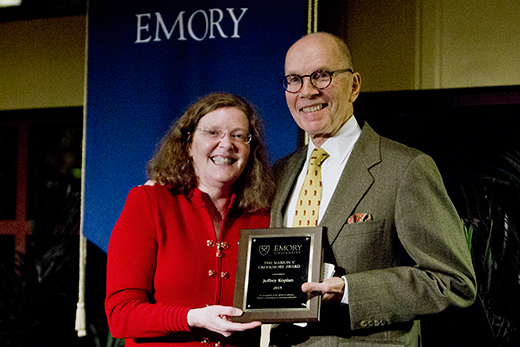 Jeffrey Koplan (right), 2015 recipient of the Marion V. Creekmore Award, poses with Claire Sterk, Emory University provost and vice president for academic affairs. 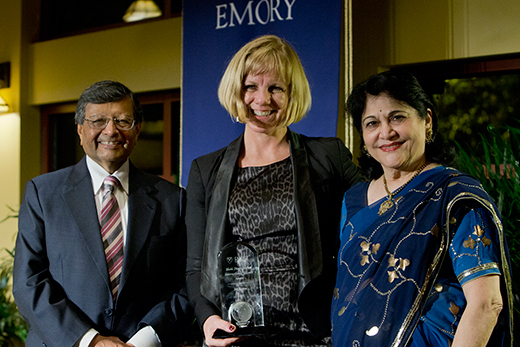 Joy Lawn (center) is the 2015 recipient of the Sheth Distinguished International Alumni Award, established through a gift from Jag Sheth (left), Charles H. Kellstadt Professor of Marketing, and Madhu Sheth. 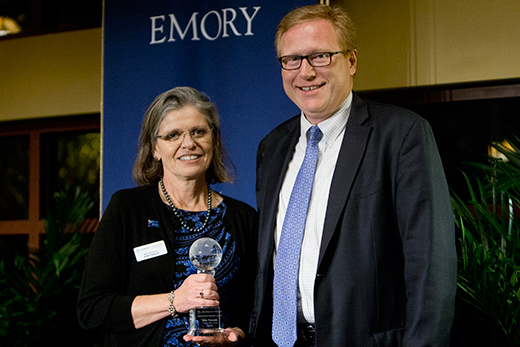 Kate Piasecki, winner of the 2015 International Outreach Award, poses with Philip Wainwright, vice provost for global strategy and initiatives at Emory. Global health leader Jeffrey Koplan, international outreach director Kate Piasecki and maternal and child health epidemiologist Joy Lawn are the 2015 recipients of awards presented by Emory's Office of Global Strategy and Initiatives. The international awards were presented in a ceremony Thursday, Nov. 5, at the Emory Conference Center Hotel. Koplan, vice president for global health at Emory, has had a career in public health spanning over 40 years, covering the full spectrum of global health issues, including infectious diseases, non-communicable illnesses, environmental issues, occupational health, child health, health services research, and health sciences education. He joined Emory in 2002 as vice president for academic health affairs of the Woodruff Health Sciences Center, having been director of the U.S. Centers for Disease Control and Prevention (CDC) from 1998-2002. In 2006, he founded the Emory Global Health Institute and served as director until 2013. He is also the co-founder of the International Association of National Public Health Institutes and principal investigator of the Global Health Institute-Child Health and Mortality Prevention Surveillance network. The Creekmore Award honors the work of Marion V. Creekmore, who served as Emory's first vice provost for international affairs and as the director of The Claus M. Halle Institute for Global Learning. It is given each year to an Emory faculty member who excels in the advancement of the university's commitment to internationalization. Piasecki is associate director of MBA admissions at Emory's Goizueta Business School, where she directs international recruitment for Goizueta's Full-time MBA Program and also works with many international student focus groups and alumni. She has expanded Goizueta's relationships in Latin America and most recently, China and Japan. She has created a number of on-site programs in Colombia and created corporate partnerships in Asia, adding Shenzhen, China, to the cities in which international Goizueta information sessions are held. Her work with the Pre-MBA English Language program has helped to build Goizueta's international base. The International Outreach Award was created in 2012 to recognize professional staff who have made significant contributions to Emory's internationalization, and who also extend Emory's reputation by contributing their expertise to international professional networks in their respective fields of research, teaching and higher education. Piasecki sees herself as champion of international recruitment. "When we assess a student we are not only looking at their academic strength but also their diversity of culture and experience," she says. "It is important for all students enrolled at the business school to have global exposure and that begins with the classroom." Lawn is chair of epidemiology at the London School of Hygiene & Tropical Medicine, and director of the Maternal, Adolescent, Reproductive and Child Health (MARCH) Centre, with over 150 academics working on women's and children's health. As a pediatrician and perinatal epidemiologist, she focuses on newborn care related to the issues of newborn deaths and stillbirths, coordinating estimates for the World Health Organization. She has worked in Africa for over 20 years, receiving funding from the Bill & Melinda Gates Foundation through Save the Children. Her work has been the basis of the "Every Newborn Action Plan," endorsed by the World Health Assembly 2014 and by over 80 partners. The Sheth Distinguished International Alumni Award — established by the generous gift of Madhu and Jagdish Sheth, Charles H. Kellstadt Professor of Marketing — seeks to recognize Emory University's international alumni who have distinguished themselves in service to universities, governments, private sector firms and nongovernmental organizations. Lawn earned a master's degree in public health from Emory and has worked at the CDC. "The MPH from Emory was an essential turning point for me, from individual clinical care of babies, to the last 15 years of developing national and global estimates and evidence base for reducing 2.7 million neonatal deaths and 2.6 million stillbirths a year," Lawn says.